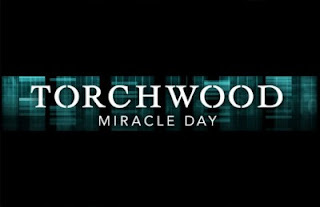 I came to the Torchwood game a little late, I've only seen a few episodes of Series 1 and finished up Children of Earth shorty before this week's premiere, so I didn't have high expectations for Miracle Day. After checking out the first episode, I was entertained but also a little let down. First off, it's hard coming off of Children of Earth and going straight into Miracle Day like I did. CoE was such a roller coaster of a series, that anything following it had some big shoes to fill. I'm not quite sure MD was able to do that right off the bat. I understand that the first episode had to re-establish the world for a new audience, but I felt that we got way too much exposition about this new storyline with little to no explanation about seasons past. I'm sure we're getting to it, but I would've liked a little bit more backstory. I was also surprised at how little the premiere episode used Captain Jack. Again, I'm a newbie to the series, but I've always been told that he's the selling point, so I was expecting him to be front and center. Instead, we got a lot of Gwen, which probably makes sense since it feels like this is her story. I was just expecting more from Borrowman. Also, some light being shed on what he has been up to since the end of Children would've been nice, but I'm sure it's coming. I'm just a bit impatient. As for Miracle Day itself, the concept sounds intriguing enough, and I'm interested to see how the explain the phenomenon, but that's about it. So far the new characters seem out of place and don't mesh well with those from the parent series. Mekhi Phifer's routine could get old fast, Alexa Havin's character could have potential but also could bore us to tears, and right now Bill Pullman's way too hammy. But it's only been one episode, and I'm willing to give it some slack. I get the appeal of Torchwood, and appreciate the world and its characters, so I'm going to stick it out a few more weeks with fingers crossed. I'll admit that MD has potential, but my TV watching schedule is filling up for summer, so I'm not sure if it'll be added to the rotation unless it really impresses me soon.